Paul Drayson trained as an engineer before studying for a PhD in robotics and his career as a science entrepreneur. As CEO he led PowderJect Pharmaceuticals from Oxford University spin-out to a FTSE 250 business and one of the world’s leading vaccine companies. 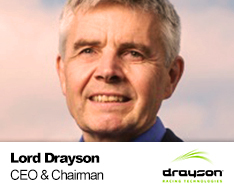 His current business, Drayson Technologies Ltd, is a digital healthcare company. Public policy roles have included Chairman of the BioIndustry Association, Minister for Defence Procurement and Minister for Science and Innovation. He is an experienced racing driver and pioneer of green motorsport, holds three FIA World Land Speed Records for electric vehicles and has competed in the Le Mans 24 hours. Paul is member of the House of Lords and has three NED roles with the University of Oxford, the Royal Navy and Airbus Group.